Today’s budget, Osborne’s first ‘pure’ budget, is a fascinating bundle of policy, politics and posturing. For us FIRE eaters, there is plenty to think about. But for me there is one unambiguous negative: the tax hike on dividends for those of us with sizeable investments. Tax the company ~20% corporation tax. Leaving £800 retained profit, payable by the company as a dividend to its shareholders. Give shareholders a tax credit with their £800 dividend, amounting to one ninth of their dividend. This basically was a slight fudge, and said the government was treating £800 divi as being £889 paid gross, with £89 of it having already been collected as tax (even though actually £200 has been collected as tax, tut tut). Then tax dividends receivers at special rates (which was a quid pro quo for the slight fudge mentioned above). Basic rate taxpayers paid 10% i.e. £89 which, hey presto, it turns out they have already paid, leaving no extra tax due. Higher rate tax payers paid 32.5% on the £889, i.e. £200 extra, leaving them with £600. This is, surprise surprise, what they’d have been left with net of tax if they’d received an extra £1000 of taxable salary. Reduced corporation tax, before too long, to 18%. So your £1000 company profit becomes £820 of retained profit, all payable as dividend in cash. Done away with tax credits. So your gross divi is now £820, not £888. But it has not yet had any tax paid on it. Given us all £5k of tax-free divi allowance. Yet another allowance, sigh. Still, this is good news for ‘small’ (<£100k investments, out of a SIPP/ISA/pension) savers i.e. nearly all voters. Changed the tax rates. Cleverly, the new rates look lower. Basic rate taxpayers will pay 7.5% on additional divi income (7.5% is lower than 10%, geddit? ); higher rate taxpayers will pay 32.5% (the same as before, right? ); additional rate taxpayers will pay 38.5% (a tiny bit higher than 37.5%, but these guys earn squillions, OK?). In fact, because of the loss of the tax credit, in effect these new dividend tax rates are now significantly higher. 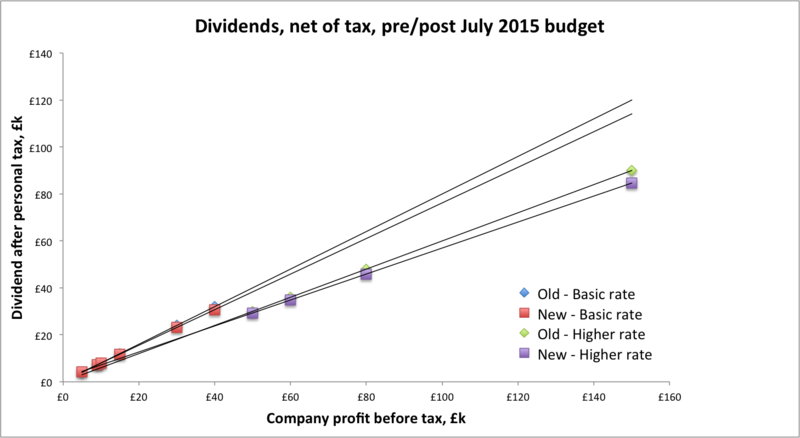 My graph above shows the dividends retained at various dividend income levels under both the Old (pre Osborne tax wedge) approach and the New (post Osborne tax wedge) approach, for both Basic rate and Higher rate taxpayers. Additional rate taxpayers, don’t bother asking – it hurts. What these graphs show is that if you have less than £9.1k of dividend income (and assuming that is your ONLY taxable income), you’re winning. If you have more, you’re losing. At £50k of taxable income, you’re losing by about £700 – less than 1.5%. But at £100k divi income you’re now keeping only £56.98k, whereas before you were keeping £60k. This is a tax rise of 3.02% in the pound. Because we are all in it together. I have to admire Osborne’s cunning here. This is too complex to follow for 98% of people, and for the 2% who care it sounds better than the old system even when you pay attention. But in fact it is due to raise £7bn of tax, and amounts to a significant tax increase on investors. What implications does this have for FIRE seekers? There is now all the more reason to favour investment in your own home (though certainly not buy-to-let, which has seen the first nail in its tax-advantaged coffin) rather than investing in productive assets. There is also all the more reason to fill your NISA/SIPP/tax-free boots. The drop in corporation tax is good news for tax-free savers. And also all the more reason to pass the silver spoon down a generation. All your kids now have £5k allowances (once they hit 18, I assume). Marrying makes sense. It always has. It does even more now, especially if he/she has a decent income but no investments; in that situation previously assets given to the better half would have been taxed at higher rates, whereas now there is an additional £5k tax-free allowance to enjoy (as well as another £1k interest allowance). We are moving closer to the US, where dividends are seen as tax-inefficient, and are therefore lower and rarer than in the UK. Expect to see more companies under pressure to swap dividends for buybacks. And be ready to pay more attention to Earnings Per Share than dividends per share. Other things being equal, FIRE now takes longer. Thanks for another interesting article. Have been trying to work through the budget implications for me. I’d thought about moving btl property to a company but the dividend tax changes make this less attractive. Am I right in thinking that this will also hurt people trading as contractors through ltd companies? I’d guess so in which case some of my options to earn pin money after leaving full time employment look less tax efficient. I agree with your conclusions on pensions and residential property. On pensions, the changes to tax relief above 150k are a pain especially for those with variable income. Are the tiered reductions based on gross or net income? @BB – you are absolutely right that this hurts people trading as contractors (/entrepreneurs) running through Ltd companies. This in fact appears to be the chief motivation for the change. Re pension relief, I’d say those with variable income are probably able to handle things better – topup your SIPP in a lean year, using cash stashed from a previous year, and watch the government give you the previous years’ tax back. For sustained high earners, £10k limit will be annoying. I don’t much trust SIPP regulations anyway so I’m not that bothered myself. I agree, FvL. You have to admire how well Osborne and the Treasury have managed to package this. It has the air of simplicity and of generosity whilst being neither. Very impressive (from a political perspective). On the plus side, the dividend tax credit has been scrapped which has caused untold confusion to millions in my experience! Also, at least the ISA has remained a highly attractive investing vehicle. Indeed, post-dividend tax changes, the stocks and shares variety is even more attractive. How long that will last who knows. But hopefully some time yet! However, generally the result for FIRE seekers is certainly not good. I think you’re right that dividend payments are increasingly looking like they are to become less attractive in the UK (a la the US). This is a great shame. At the current tax rate I suspect any such change will be slow coming. However, if they revise it upwards it will certain start to occur apace. What is the position of dividend income received by a company rather than an individual? At the moment a company receives this dividend income with no additional tax liability. @IanH – good question. The changes are described in the HM Treasury document as applying to ‘Individuals’, and are omitted from a list of changes affecting ‘Businesses’, but I suspect there is smaller print out there than I have found. For the self-employed/contractor that gets paid via divs from their LTD company this is bad news, but for the investor it’s easy to avoid the hit. You can buy total return ETFs (especially with CGT now reduced to 20%). Even for individual shares or indices with no total return instruments, you can work around it by either selling before the ex-div date and buying again after, or buy switching to deep in the money options instead of actual share ownership. A bit more work but not too bad. And again, for the passive investor of the index tracker variety, just switch to a total return one (for example SWDA.L) and you have no div tax to pay. And if you want “income”, just sell 3% of your holdings every year and enjoy your new much lower taxation.